A brand new tale in the world of Monkey Island is out, and I'm hoping for a fun old style game in the vein of the classic adventure genre. I went ahead and pre-purchased all five episodes, and can't wait to delve in. But, before starting to the new stuff, I decided to refresh my memory on that which came before. This is a review of my experiences with The Escape from Monkey Island. I think this is my favorite game in the series. Like Monkey Island 3, I had Monkey Island 4 on CD. Unlike Monkey Island 3, MI4 is not supported by SCUMMVM. I was on my own getting the game to run. Thankfully the game installed and ran with no problems. Unfortunately, this Monkey Island is buggy in the "CD" state, so I had to search around and find a patch, here or here. For some reason my mind told me to look for patches before starting the game; perhaps I have some deep routed ill memories about this title somewhere below the surface. Even with the patch, there was still a show stopper bug. When talking to some chess pirates playing , if you don't finish the puzzle the first time entering the screen the game locks up when you come back later to finish. Unfortunately, you can start the chain of events without knowing there is an actual puzzle going on yet. I had to restore a previously saved game going quite back a ways in order to get past the bug. In retrospect I remember having this problem the first time around too. There is also a 3rd party replacement for the MI4 loader, which supposedly gives you an easier way to install the game, download the patch, and change various settings. I could never get it to work, unfortunately, so can't comment on it. The idea sounds promising, however. 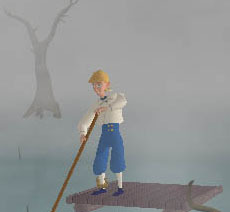 Escape from Monkey Island is the first 3D Monkey Island Game. I'm not sure if the 3D rendering adds anything to the game, but it didn't detract either. The look of the game was very similar to the style of the previous game; which had the visual appeal of a cartoon. I don't mind cartoons, so it was all good. This game uses the keyboard as the primary interface, so no more point and click. I remember this frustrating me greatly the first time around. Imagine a game from the year 2000 that didn't use a mouse? This time I didn't mind the keyboard usage. It took a while to get used to, but once I was there it was fine. That was a great Honeymoon, are we dead? 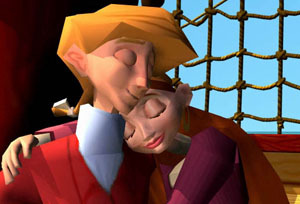 The game starts with our heroes, Guybrush Threepwood and Elaine Marley, coming back to Melee Island from their honeymoon. Unfortunately, Governor Marley has been declared dead and they are trying to demolish her house. As Elaine goes off to get herself declared undead--no not like that---Guybrush tries to stop the house demolition. Along the way we reintroduce LeChuck as a political candidate in the Melee Island Governor race, Ozzie Mandril an Australian real estate developer turning all that is piratey into big tourist traps and a quest to unravel the secret of the Marley Heirlooms and discover the ultimate insult. The tourist traps offer great ways to make a mockery of pop culture, taking stabs at Planet Hollywood, and Starbucks. The puzzles are logical and somehow manage to avoid the endless point and click until something works phenomena that exists in much of the genre. By introducing some random element into the puzzles, the puzzles are slightly more varied and require some thought to solve. For example, in one point you need to figure out how a filing system works to find the hideout of a thief on Lucre Island. The filing system is consistent, but the name changes, so each time through the puzzle is slightly different. As you would expect, Guybrush has to find a ship and a crew. Each adventure leads to the next, eventually leading to Monkey Island a final show down with LeChuck. 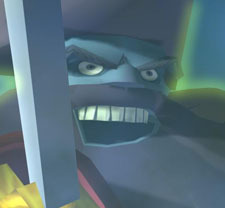 In part 1, LeChuck was a ghost. In Part 2, LeChuck was a zombie. In part 3 he was a demon. This time they switch between all three personas as LeChuck's character takes shape. I especially liked seeing Ghost Pirate LeChuck rendered with "modern" capabilities. The insult sword fighting idea returns in this game as Monkey Combat. You need to shout a series of nonsense monkey words to move to a position. Each position wins over a different position and you banter back and forth w/ your opponent. This is the weakest point in the game, unfortunately. It is tedious to figure out the magic commands and it feels like just a roadblack to enjoyment. The banter between the Elaine and Guybrush is fantastic and for me really nailed the essence of the characters. Guybrush was a bit more naïve, and focused on comic relief. He played his character as if he were a kid in a candy store, and everything he explored was new and exciting. Elaine, on the other hand, takes the more serious stance on things. The voice acting and characterization of all the characters is what really made the game a joy to play. Well, I'm out of legacy Monkey Island games to add to my playlist. I guess it is time to move on to something more recent, the Launch of the Screaming Narwhal. This is my first foray into episodic gaming and I'm not sure what to expect. I hope the five episodes of Tales of Monkey Island are equal (or greater) than a single game. We'll have to see how it goes.